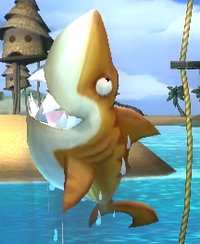 Yellow Snaggles, also referred to as Super Snaggles or simply Snaggles, are shark-like species derivative from Snaggles that appear in Donkey Kong Country Returns, Donkey Kong Country Returns 3D, and Donkey Kong Country: Tropical Freeze. They are yellow with sharp teeth, and resemble tiger sharks. Like regular Snaggles, they leap out of the water at regular intervals, but will make a quick additional leap right afterwards without any warning. They appear in the Beach world, and in some other levels, including Damp Dungeon. They can only be defeated by being struck with a barrel. If the Kongs are snatched by a Yellow Snaggles, they will lose a heart from their health meter. Yellow Snaggles make dog noises when they jump out of the water, just like their relatives. In Donkey Kong Country: Tropical Freeze, Yellow Snaggles chase the Kongs through the water, much like their relatives do. Unlike standard Snaggles, which post themselves in a specific spot while the Kongs are above, Yellow Snaggles will try to keep track of the characters even when they are above the water, although without being able to jump out. These enemies can only be defeated with a swipe of Cranky's cane. Attacking a Yellow Snaggles with a corkscrew move will not affect the enemy, and will result in the Kongs getting damaged instead. This page was last edited on September 9, 2018, at 14:55.